When we talk about being strategic we focus more on thinking and planning, than on leading and achieving. The reality is that “being strategic” requires both; it’s the full transformation from dream to result. It’s not that we forget to transform our vision, but often our approach to leading that change is not effective enough to generate our desired results. 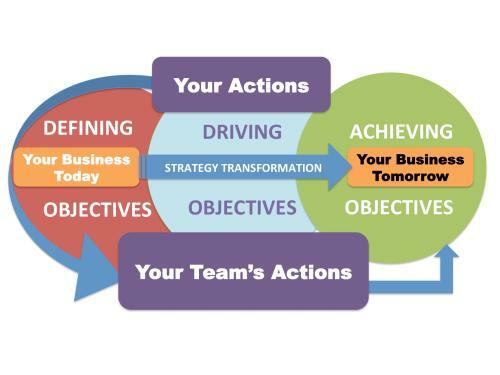 Here is a model for strategic transformation-how to make your vision real. Define & quantify the market today, as well as future trends. Assess your current financial & cultural situation. Understand your customer’s perception of your business vs. their needs & expectations. Determine how you want to change all of that over a period of time, 12-24 months, or three to five years. Develop the company’s vision, or the vision for what that future looks like within your own department-what will you impact. How are you doing so far? Do you have this stage of the strategic process as part of your routine? Most of us do, and most of us are part of a team that works together to master the thinking & planning stage. But what about transforming the strategy into results? Are you strategic enough to make that happen? Your thought process alone will not generate results. Certain actions are required to create a new strategic reality. So when you think about quantifying how strategic you actually are, it is important to think beyond the theoretical question of where you want to go, and think instead about what you will do to ensure the strategy transforms. This is the Leading & Achieving stage of being strategic. It is a process of “Strategic Transformation” allowing you to consciously change the organization into something you want it to be. 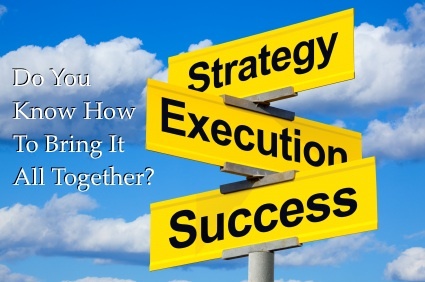 There are three key components necessary to transition strategy into results. Once you understand them, you can perform, not only think, but perform in a way that makes strategy real. Your ability to do so defines how strategic you actually are, and sets you, your team and your business apart from the rest. 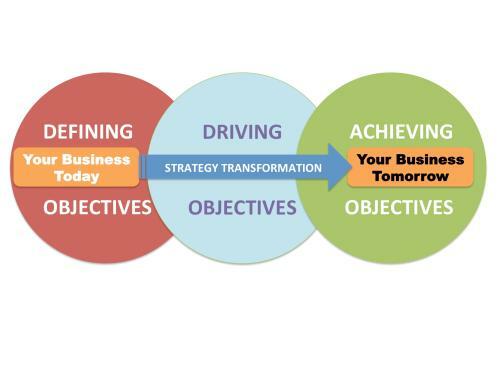 Let’s start by looking at organizational objectives in three phases: Defining, Driving and Achieving Objectives. Many leaders spend the bulk of their time Defining objectives and then focus their efforts on achieving them, leaving the driver seat to others, or neglecting it all together. When it comes to strategy transformation, Driving Objectives is just as important as defining and achieving them. It is not an operational task, nor should it be considered maintenance, it is driving change and that requires the strategy owner to lead the process in order to make it successful. So how can you ensure you are driving your strategy toward achieving its objectives? You can start by channeling Your Actions toward inspiring & supporting the Actions of Your Team; they are the ones that make your strategy real. Strategic leaders communicate objectives and drive people. 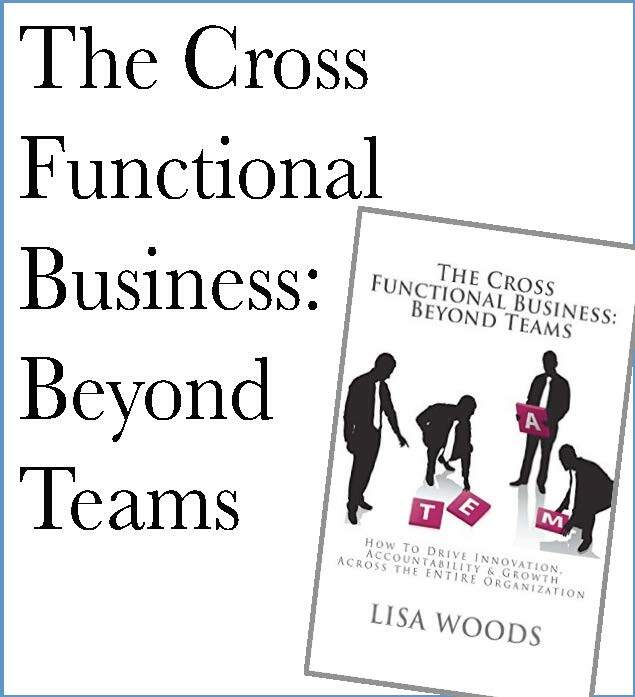 Getting your team to focus on results is your primary role in the transformation process. This is depicted in the diagram below. When you look at your actions, how do you spend your time each day? 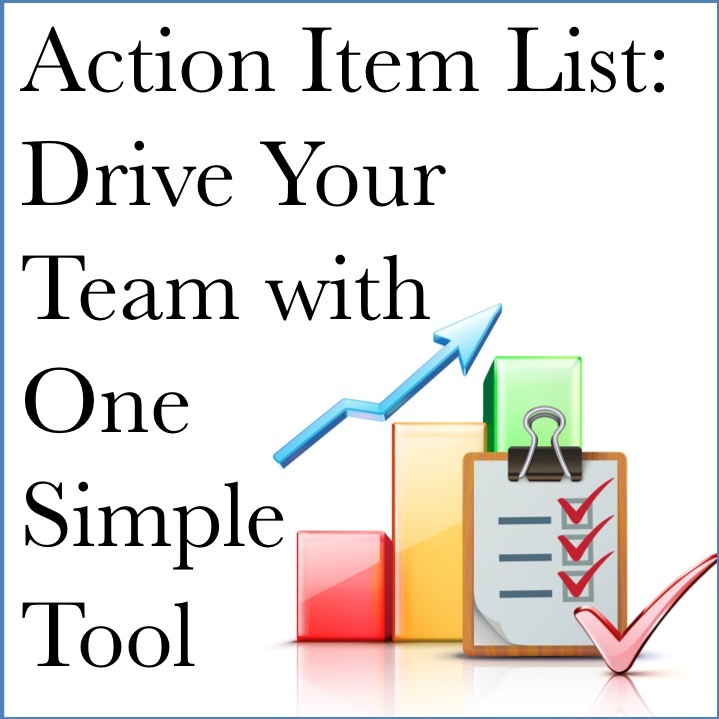 Are you driving results, or are you driving your team to achieve something new? They are two very different concepts. When you drive results, you tend to focus more of your energy on achieving them through your own abilities, your own actions, your own approach, and your own ideas. This takes up a lot of your energy and as a result, takes time away from your ability to drive others. As a result your team becomes underutilized, or worse…they work on things that are not aligned with the strategy transformation, making objectives more difficult to achieve. When you drive your team to achieve something new you create a sustainable infrastructure aligned with your strategy. I’m not suggesting that you micromanage them to accomplish tasks the way you would do them yourself, instead, focus on communicating objectives and driving them in a way that inspires your team to achieve them. In order to make your company’s future real and sustainable, your team must embrace your strategy as their own. Your role is to ensure this is happening throughout the entire strategic transformation. Your Team’s Actions should be focused on achieving new objectives, communicating creative ideas back to you and acting differently in order to generate a new result. They require your support and guidance throughout this process. Remember, they are a pool of resources that outnumber you alone. They are your team, the vehicle you use to transform your business; they are your business of tomorrow. But they can’t get there without your motivation, your ability to communicate the vision, your ability to facilitate creative thinking, and your ability to set the course and keep it at the forefront of the organization. You have it in you to educate and motivate others because the vision is yours; you know it better than anyone. Use it to share, engage and provoke your organization. So how strategic are you? Many organizations create a “Vision” of tomorrow, but fail to create the actions necessary to “Transform” it successfully. They get stuck in the Thinking & Planning stage and neglect the Leading & Achieving stage. Strategic Leaders embrace objectives (defining, driving & achieving them), they focus their own actions on driving the actions of their team, and ensuring their team fully embraces achieving the objectives that define the business of tomorrow. What do you use to define your business today? What do you focus on more? When do you communicate your strategy? When do you modify your strategy? The higher your score (on a scale from 1-18), the more strategic you are; you have the ability to envision and transform with a high likelihood of achieving your business goals. If you answered “1” to any of the questions, focus there and start to modify your approach toward more strategic alternatives. Remember, a strategy is an idea… many people have great ideas… but to be truly strategic means you can take that idea and turn it into reality. It doesn’t matter if you are a company president, director or manager, strategic minds exist at all levels of an organization. Take the time to start developing your strategic abilities now, both in yourself and your team. Lisa is a successful entrepreneur, world-class marketing strategist, dynamic business leader & author with more than 20 years experience leading, managing and driving growth in the corporate world. 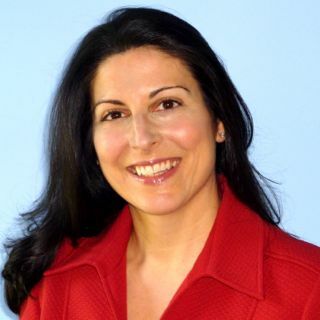 Today she provides Management Tools, Do-It-Yourself Training, and Business Assessments for small to mid size companies, Lisa utilizes her experience with integration techniques, organizational and cultural overhauls, financial turnarounds and strategic revitalization to help other companies succeed. Closing the gap between strategy and hierarchy through the use of effective communication skills, Lisa's techniques successfully develop employees into exceptional leaders, results driven managers and passionate team contributors that collectively exceed objectives. This is a nice strategical grill that comes along with talent or thorough field training and experience that inter-twins with the art of emotional intelligence for a shared achievement drive with the team on board. Otherwise, unreliable team members would keep derailing or procrastinating approved actions reciprocating on the entire program. Tel:+256 414 575584, Cell: +256 712/702986754. Posta Ug. No. 73680, Queens Clock Tower, K'la - Uganda. Thanks for sharing the link. The execution of the strategy is where many fall down. It sometimes takes a different skillset to "make things happen" and to adjust the plan as becomes necessary in light of engaging with reality. I always liked the quote "No plan survives first contact with the enemy". It doesn't mean not to plan; it serves to remind us that things don't always turn out the way we expect - hence the need for good risk oanagement and for the omnipresent mindset of "Plan-DO-Check-Act".